A SEAL's promise is not only something to live for, it is something to die for. Special Operator T.J. Talbot, raised in a string of foster homes and nearly tossed from the Brotherhood, is forced to make a deathbed promise to care for his best friend's wife and baby. At home, Shannon Moore wants nothing to do with the community or anything that reminds her of her fallen SEAL husband, until fate steps in to show her she is still connected, and needs the love of this flawed warrior who shares her grief. 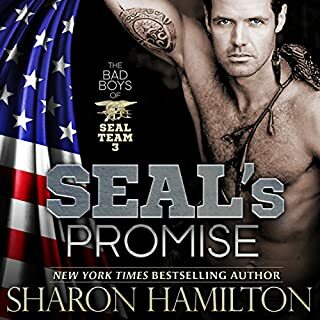 Where does SEAL's Promise rank among all the audiobooks you’ve listened to so far? SEAL's Promise has to be my fravourite audiobook so far. I knew I'd enjoy the story but the addition of the wonderful narration just blew me away, I loved it. This is a very emotional story and I was brought to tears many times. But they were not all sad tears, plenty were tears of joy. And I liked how T.J. wasn't afraid to show his emotions to his girl. This is the first book that I've listened too that has been narrated by J.D. Hart. His performance though was wonderful, he definitely has a great talent for telling a story and I would purchase more of his work. What did you love best about My Fierce Highlander? I love highlander romance and the miss, matched, couple in the story has to be one of my favourite story tines and that he was a broken-hearted widow. I liked to see how their relationship developed, they both were torn in different ways, so it was interesting. What about Andrew Bryan’s performance did you like? I always like Andrew Bryan's performances, he is able to separate characters with his voice, create suspense, and add humour. He also has a soft Scotish brogue which is very important. Will a Highland Warrior find love with a stubborn English widow? Battle-hardened warrior Dirk MacLerie isn't who everyone thinks he is. He's Dirk MacKay, heir apparent to the MacKay chiefdom. Lady Isobel MacKenzie is a beautiful, young widow betrothed to yet another highland chief. But when her future brother-in-law accosts her and threatens to kill her, she is forced to flee into a highland snowstorm. She runs into a rugged, imposing man she thought dead. Tantalizing Isobel fires up Dirk's passions, but she's bound to another man by legal contract. She tests his honor, even as his treacherous clansmen plot his downfall. Would you listen to My Brave Highlander again? Why? Yes I would listen to this novel again. The story line was very good, I enjoyed it very much and the characters very likeable. My favourite character had to be Dirk. He really wanted to right all the wrongs that were handed to him, and he also was a very honourable man where Isabel was concerned. Dave Gillies did a nice job with his narration of the story, it was a very entertaining performance. i was greatly alarmed when Isabel was being attacked by her future brother-in-law, I had a real nail biting reaction to that. Retired soldier Blake Best drives hard - his car, his life, and his choices. Former Airman Parker Monteith is fighting to keep his life on cruise control so he doesn't lose it all. One Maserati brings them together. Can Blake slow down enough to discover the important things aren't in the fast lane? Would you listen to Cruise Control again? Why? I think Blake was favourite character. He was more brash and loud, more of a bad boy type. What does Jason P. Hilton bring to the story that you wouldn’t experience if you just read the book? Jason has a very soothing voice and is able to draw the listener into the story. I like how he is able to change his voice for different characters, but not ridiculously so, just to the right level. The most moving moment had be when Parker is told that his grandmother had passed away, that was very sad. And then also when Blake informed him that he wasn't alone, he had Blake, that was a great ending. A great story, well read! 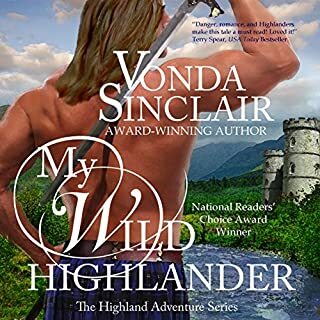 Would you listen to My Wild Highlander again? Why? Yes I would listen to My Wild Highlander again. The overal performance was very well done, and the story is very entertaining. What was one of the most memorable moments of My Wild Highlander? The most memorable for me had to be when Lachlan had to go to the Dr. to check his health but was caught outside by his two friends and had to explain why he was seeing him. That was a classic. Have you listened to any of Andrew Bryan’s other performances before? How does this one compare? I haven't listen' to any of Andrew Bryan's performances before, but I certainly will remember his name and I hope to hear him again, he was really good. The story made me laugh and smile, the hero was such a rogue and the heroine just didn't stand a chance. I also liked how thoughts were made known, that was very different. Nights with Clay and Julia! This has to on of the best audiobooks I've heard up to now. The narration of the book was very well done and kept my interest right through to the end. I liked the fun and banter between Clay and Julia, it made them seem more like reall people instead of just fictional characters. Have you listened to any of Josh Goodman’s other performances before? How does this one compare? I think I've Josh Goodman before, he has a very recognicable voice. I think his performance was just as good each time I've heard him. But I enjoyed this one more, only because I liked story better. Oh! yes, once, I started listening it was hard to stop any way, I so wanted to see the couple together. After listening to Night After Night I will be eagerly awaiting for the next Seductive Nights book to made audio.